Developments in educational systems are inextricably linked with the social and political evolution of nations. Nowhere is this more clearly to be seen than in the history of the English sixth form. Originally published in 1982, this book, whose authors had been associated with a number of research projects into 16-19 education, traces the tradition of the sixth form from its origins in the public schools of the nineteenth century through to controversies at the time, over sixth form and tertiary colleges and the extension of 16-19 education to embrace youth opportunities programmes and other semi-vocational courses. 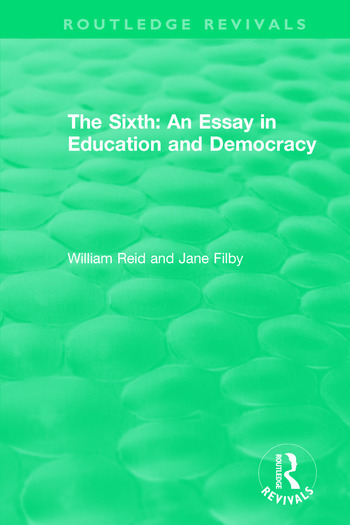 It shows that ‘the sixth’ has not only been a significant element in its own right in the adjustment of English society to the challenge of democratic ideals, but has also played a key role in the evolution of secondary education from the endowed school of the nineteenth century, through the municipal grammar schools set up after the 1902 Education Act, to the comprehensive secondary schools of today. In fact, the fate and future of comprehensive schooling becomes fully understandable only through a study of the sixth form tradition which has shaped the activities of educationists and policy-makers over the last hundred years. The authors conclude that educational policy-making is both facilitated and constrained by the existence of enduring traditions stemming from the past: in fact, the work of policy-making lies precisely in the constructive reinterpretation of that inheritance. This book describes and clarifies the nature of the tradition of sixth form education which has been handed down to us, and its relation to democratic values and institutions. Acknowledgements. 1. Education, Democracy and the Sixth Form 2. Origins of an Educational Ideal 3. Secondary Education and the Middle Class 4. A National Institution 5. A State Responsibility 6. The Grammar School Tradition 7. The Category Expands 8. The Golden Age 9. The Forces of Change 10. Colleges and Comprehensives 11. A Clash of Ideologies 12. Understanding the Past and Choosing the Future. Statistical Appendix. Name Index. Subject Index.